Men’s Interdenominational Bible Study 7:00 A.M.
Bible Study & Prayer Service 6:30 P.M.
Fellowship Bible Coffee 10:00 A.M.
We believe in prayer and have weekly prayer list updates every Wednesday evening at 6:30 P.M. The prayer line number is (912) 635-4849. Jekyll Island Baptist Chapel prepares and delivers food and water to the World Changer volunteers as they provide for the needs in the Brunswick community. Monthly Game Night held at the Chapel’s Parsonage is a popular activity. We gather to share fun and fellowship over table games and snacks. Quarterly Mystery Trips are very popular at the Baptist Chapel. Folks gather to ride the bus to an undisclosed location to share in fellowship and a meal at an area restaurant. The first Tuesday of the month the Baptist Chapel provides the workers to cook and serve the meal at The Manna House in Brunswick. Come tap your toe to the Word of God. The First Baptist Church in St. Marys, Georgia supports a Blue Grass band that comes to sing and witness to the fellowship at the Baptist Chapel. Proceeding the music time is the meal of bar-b-que and fixings. This is a time to recognize the First-Responders on Jekyll Island. The State Patrol officers, Firemen and Medical Techs help keep us safe and serve to protect lives. All ministers that serve on Jekyll Island provide the staffing for the annual Easter Sunrise Service. This service is held at the Great Dunes Park where there’s a spectacular view of the sunrise. The Baptist Chapel holds an annual Christmas Eve service which is well attended by the Island’s visitors and residents. 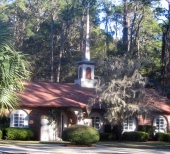 The Baptist Chapel is a resort ministry. Many of the island visitors are long time attendees, and are here for 3 to 6 months. They become in effect members of the Baptist Chapel. These away-from-home members are called Watch Care members of the chapel and are ministered to at their home away from home. When a new convert desires baptism, the Baptist Chapel will use the beautiful ocean at Jekyll Island. The Atlantic Ocean provides a convenient place to baptize when the temperature is just right. The Baptist Chapel has a dinner-on-the-ground each second Sunday of the month just after the morning worship service. All are invited to the fellowship and a great covered dish or potluck meal is provided. This gives us time to meet and get to know each other better over a meal. Every Sunday there is a fellowship coffee after the morning worship service. This give us all time to greet and meet our visitors and guests and get to know them better. There are many opportunities to serve all over the world. Some of the members at the Baptist Chapel regularly minister in overseas opportunities in Brazil, Thailand and other places. Much prayer and support is provided to specific missionaries personally known by Jekyll members.